Want to have them before the restock? Contact us for a special order. You will be contacted for specific shaft lengths, shaft spine, and tip grain weights. The FANG™ arrow nock is designed in Minnesota and manufactured in the United States. This nock embodies the three ideals that motivate every COYOTL® product: functional, elegant, minimal. Function: The FANG™ combines the historical and contemporary functions of arrow nocks. The ancient nocks were wider and did not clip onto the string. Many of them had nobs or ridges between the end of the arrow shaft and the nock to assist in rapidly moving arrows onto the string and to assist in holding arrows in the hand. Because modern arrow shaft construction produces uniformly rounded shafts, we lost those unique features. Until now.I have invented, prototyped, and tested a new nock that has both the ancient and contemporary features necessary to facilitate the world’s wide variety of shooting styles. They are much wider than standard nocks, but they also clip beautifully onto a bow string. other features that accommodate almost any drawing style: pinch the arrow, pinch the string, three under, one above two under, two, thumb guard, etc. Elegance: The minimalist design changes nothing about the functional length of your arrows. 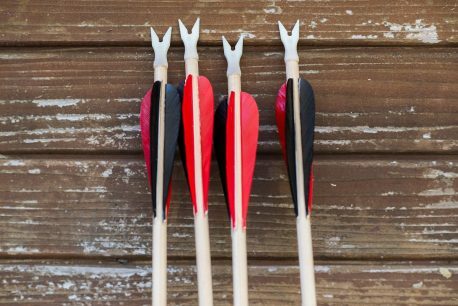 The distance between the top of the nock and the point at which the string pushes against the nock is the same distance as most conventional nocks. If you measure your arrows from behind the point to this point on the nock, the length is identical. Also, even though the nock is slightly heavier than a conventional nock, it changes nothing about the arrow spine. In addition, the nock can be fired from the right or left side of the bow. Minimal: The FANG™ is made of ABS plastic, a higher quality plastic than conventional nocks. This is stronger and more durable, even though it is still very small. A strong nock protects the arrow shaft from the points of other arrows when target shooting. 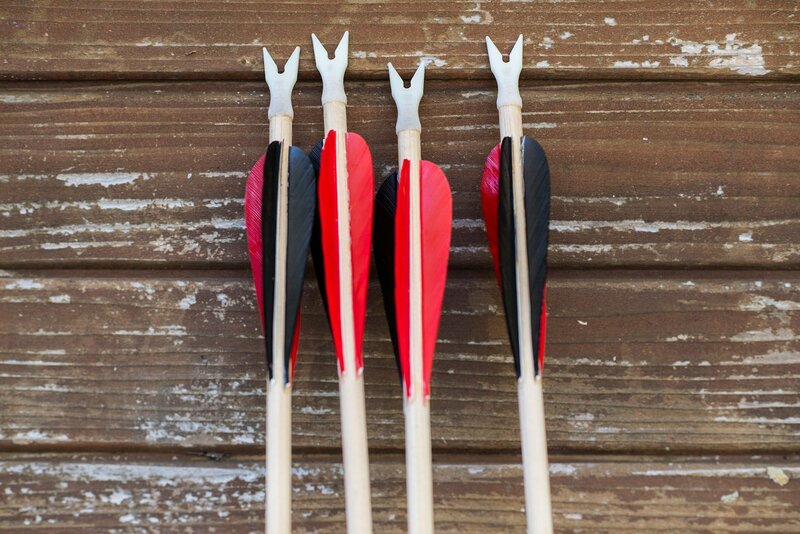 The increased durability of ABS plastic means that these nocks last longer than conventional nocks and will not be as prone to being cracked or broken by other arrows during target practice even though they are larger. This FANG™ arrows feature a perfect combination of nock, shaft, and feathers. They work from both sides of the bow. They work with all drawing styles. And, the four feather construction means that no matter how the arrow hits the string, it’s the right way up—this will increase your speed. Also, the 75 and 105 degree orientation of the feathers provides superior release and flight stability. Whether you are interested in speed shooting or historical shooting, these nocks provided you with the necessary functionality to learn these styles and more rapidly enjoy success. Orders will ship in 4 to 6 weeks.